It doesn't matter how many suits, jackets and trousers you have, if you don't have the staples you're going to encounter situations where you'll have trouble finding something appropriate to wear. These staples are a grey or a navy suit, or preferably both. During the last years I have not paid enough attention to these basics of wardrobe building and had ended up in need of a new grey suit. In job situations, a grey suit is often more appropriate than some of the other suits and jackets I've recently written about here on the blog (like this boating jacket or this checkered three piece). Though it's a grey suit, it doesn't have to be a boring suit and it should also be a good quality suit. In other words, it's not a purchase one should take lightly as it is likely to be a suit that will be worn frequently for years to come. The best option is, of course, always to have a suit made to your specifications by a tailor, but this time my budget didn't allow for that, so I started looking for ready-to-wear suits which were within my budget. No matter how great it is to have a suit made for you, I also very much enjoy looking for off-the-rack suits. There are so many nice suits available and if you make the necessary adjustments after you've bought it, it can fit just about perfectly. What I ended up buying was a suit from the London based company Without Prejudice (from now on mostly shortened to WP). To be honest with you, I was not familiar with the WP brand before I started the search for my new grey suit. Now that I've got one of their suits and gathered some knowledge about the brand, I quite like it and think it is well worth a blog presentation. Without Prejudice is a relative young brand, established as recently as in 2006. In their own words, the founders "believed that for too long menswear had been over-hyped, under performed and continuously failed to meet the high level of quality that London promised to its respected customers. The solution was as simple as it was ambitious: embrace change and inspire innovation, communicate individuality over mass appeal and build a brand that would never sacrifice quality for quantity." During the last eight years, WP has grown to be a brand producing seasonal collections of suits, jackets, shirts, coats, knitwear, shoes and accessories. To what extent they have managed to fulfil all their ambitious ambitions, I couldn't possibly say, but I would like to say something about the quality and the individuality of the WP garments. One clue to the quality of the products are found in their complete openness about the production of their garments. If there's one thing I like, it's companies who are transparent with regard to how and where their products are made. It shows that they take pride in their company and how it operates. In a time where "made in Britain" is one of the biggest selling points for many British companies, and where British companies without UK production tries to be secretive about the origin of their garments, it's quite refreshing to see a British company being proud of their operation despite producing their clothes outside the UK. As I mentioned in my last blog post, I think it's important to embrace quality wherever it is and that the quality of the products and manufacturing are more important than which country it's produced in, and I believe Without Prejudice is a good example of this. The fabric for all the WP suits are produced in Italy, a country well renowned for their long history of top quality fabric production. Among others, they use fabrics from well known cloth manufacturers like Reda, Zegna, Ormezzano, Zignone and Marzotto. The fabrics are all made from natural fibres like wool, cotton, linen, mohair and silk. The finished fabrics are than transported to Hungary where the suits are made. Hungary has a textile industry going back centuries and, after set backs during the World Wars, the break up of the Soviet Union and economic changes in 1989-90, and the increased competition from China in the 90s, the industry has managed to change and adapt and still thriving today with the sector employing around 50.000 people. You can read more about the Hungarian textile and clothing industry here. At the WP factory, a team of skillful embroiders hand sew the suits and jackets with meticulous attention to detail. Due to this attention to detail, they only manage to produce about 100 suits a week, which shows that this is a company valuing quality more than quantity. The finished suits are than examined and, when approved, shipped to London where they are further distributed to retailers and customers around the world. 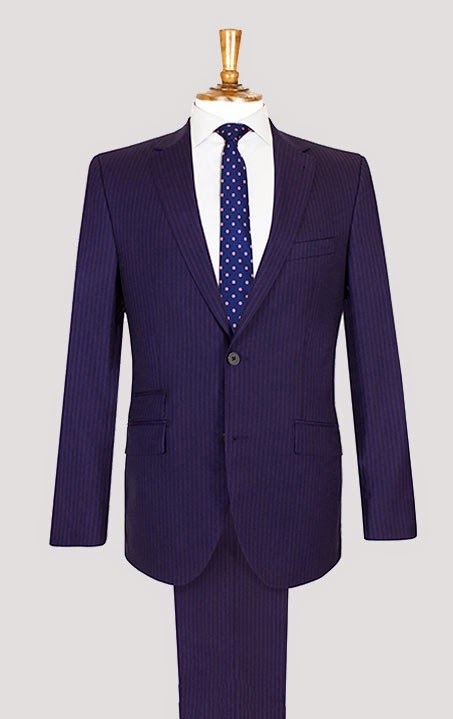 The final result is a top of the line British designed, Italian crafted, Hungarian made suit, with a beautiful Kufner interlining with a three ply semi wadded cotton chest piece, carefully fashioned into a natural fit, that while remaining resilient to wear and tear, offers a very light final product. Having discussed the quality of the suits, it's time to talk about the individuality of the WP suits. There are several small details which set these suits apart from other ready-to-wear suits. The quickest way to recognise a Without Prejudice suit is to look at the button hole on the lapel and the top button hole on the cuffs. Unlike all other lapel button holes you've probably ever seen, the one a WP jacket is vertical rather than the standard horizontal. With regard to the cuffs, a variety of different button formations are used, from the common four button working cuff to the more unique two plus two button cuff or the five kissing buttons cuff. But, a unique detail of the WP cuff is the final button hole which is always purple. Another feature worth mentioning are the shoulders where the stitching has been brought slightly forward to create a better fit for the average person. The lining is also carefully designed to add character to every jacket, and they have also added something I've never seen before on suit jackets, carefully sewed on sweat pads. 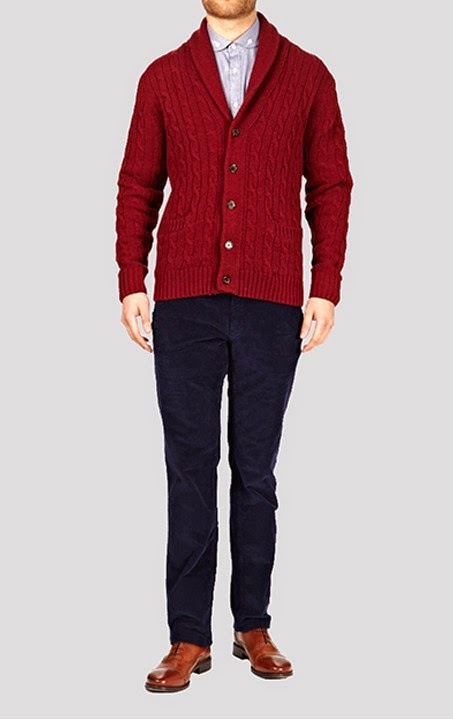 The trousers also have something you rarely see on ready-to-wear suits, adjustable waist bands on each side. also see the rather uncommon two pus two button configuration. The suit I bought was the one called Kimberley. Bought from House of Fraser which has a good selection of WP products. It's made from a 100% wool, striped birdseye fabric produced by Reda and although it looks all grey, there is a hint of purple in the stripes which is hardly visible unless you pay close attention. The very subtle purple gives the fabric a certain "je ne sais quoi" which makes it kind of special. 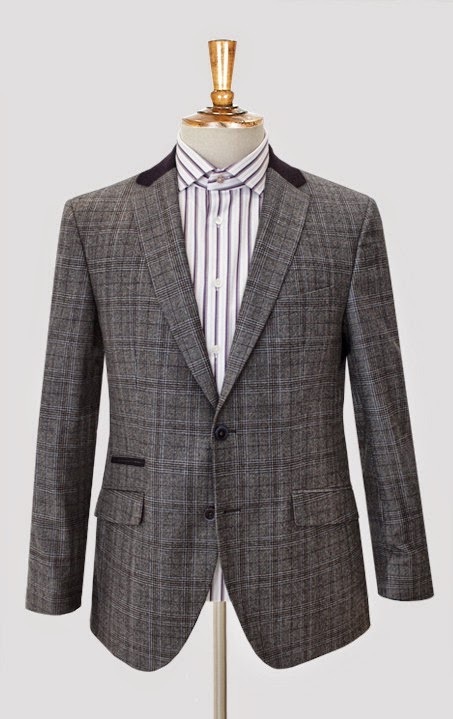 The suit has a single breasted jacket with one button and notch lapels. It has three pockets, two with flaps and a ticket pocket without. It has five kissing buttons on the cuffs, but unfortunately the button holes are not working. This is not a huge problem, but I definitely prefer working cuffs and as the suit was described as having working cuffs, this was a slight disappointment. Anyway, I'm quite pleased with this suit and, after all, that is the reason I'm writing this post. My new Without Prejudice suit. the lining of a jacket is very important. Notice the signature purple button hole. As I mentioned in the beginning, Without Prejudice carries a whole range of products, but it's mainly the suits and jackets I really like, and a cardigan I really wouldn't mind. Below you'll find some of my favourite WP products. 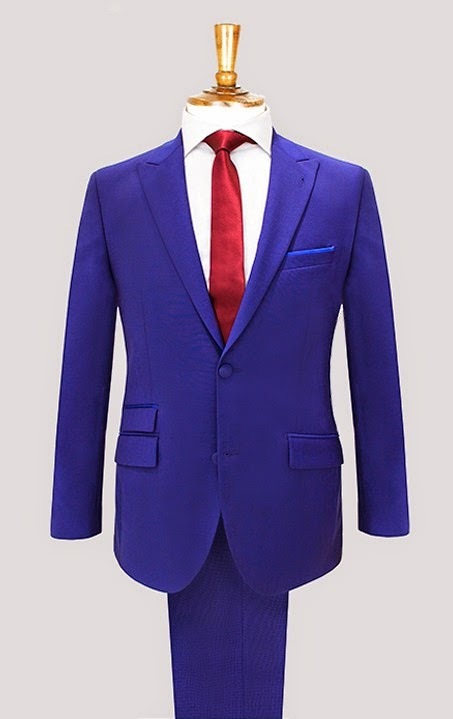 peak lapels in a magnificent blue colour. classics but with a WP twist.